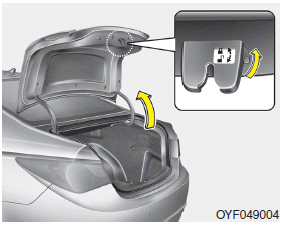 The trunk lid control switch is used to prevent unauthorized access to the trunk. When the trunk lid control switch is UNLOCK position ( ), the trunk can be unlocked with the trunk lid release button and the transmitter (or smart key). When the trunk lid control switch is LOCK position ( ), the trunk can be unlocked with the master key (or the mechanical key of the smart key) only.